Fancy a change? We now also offer white iPhone 5C screen replacements. Free delivery to many towns in Surrey. This is a same day at your home or work local service. There is no need to send your phone in the post to an anonymous business or arrange expensive reconditioned swaps with Apple who current charge £219 for iPhone 5C reconditioned swaps. The Apple swap process involves arranging an appointment with an Apple store which takes a few days and in the process you will lose your old phone and also your data and pictures. If you would prefer to go to an Apple store we would strongly advise you to backup your phone to iTunes and then restore your backup a few days later when the reconditioned phone arrives. You will then need to manually set all saved passwords on the reconditioned phone, this includes: email account information, safari automatic logins and app logins. With our iPhone 5C repair service you can keep your existing phone along with all of your current data, email and app settings. All of this without any hassle and within 20 minutes of our engineer arriving directly to your door! 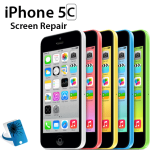 We can repair almost any iPhone 5C faults including iPhone 5C screen repair, camera repair, and speaker repair. What others won’t tell you: It is important to note Apple’s new policy on repairs. Apple will now invalidate warranties if you drop your phone and have it repaired. The only way to maintain the warranty is to buy a reconditioned swap with Apple. The swap is incredible expensive so you will need to justify and balance the cost of going to Apple and paying almost triple the amount just to maintain the warranty. Apple phones are incredibly reliable so will rarely need to be replaced under warranty. We do however advise you to use the services of a reputable company who are specialists in iPhones to have your phone repaired and to prevent future problems from occurring. Book your iPhone 5C screen repair on-line today.